At seventeen, Nicole believed her life was just beginning. A senior in high school looking forward to college and living on her own, her dreams vanished the moment she became injured. Diagnosed with the neurological and chronic pain disorder, complex regional pain syndrome (CRPS), Nicole was living a nightmare as mainstream medicine viewed her pain and symptoms as both untreatable and incurable. No, It Is NOT In My Head: The Journey of a Chronic Pain Survivor from Wheelchair to Marathon, will offer hope, present answers and allow others to believe in the unimaginable. It is not only one young woman’s story back to health, but also a culmination of our stories back to health. "If you have pain and only can read one book, please read this book by Nicole. As founder of www.uspainfoundation.org, I have met many people with pain who need help, hope and strength. I have only come across a very few who consider it a gift and take their pain and turn it into something great. Nicole is a gift to all of us in the pain world and is a shining light and example of hope. We all have it inside of us and need to find it, this book will do that for you. I am so excited to be a small part of Nicole's mission, and I hope you become a part as well." "There is nothing more terrifying than not knowing what's wrong with you. "No, It is Not in My Head: The Journey of a Chronic Pain Survivor from Wheelchair to Marathon" is a memoir of Nicole Hemmenway as she tells her tale of trying to overcome chronic agony in her life and how she was unable to truly figure out what was ailing her, as her chronic pain led her to being unable to live her life. Recovery seemed impossible, but she fought through it, making "No, It is Not in My Head" a riveting and uplifting tale, not to be missed." "Nicole is very explicit in details describing her journey through a medical system not designed to help people with an invisible illness like chronic pain. Physicians want to treat things they can see and measure, but pain often shows no signs. This journey that Nicole has been through which lasted years, is likewise being experienced now by thousands of our soldiers, sailors, marines, and airmen from line of duty injuries who in many cases end up with lifelong disabilities from a disease called RSD/CRPS--which can be reversed if treated early. While their pain is REAL, they are often scoffed at not only by doctors, but by their peers as malingerers. While these wounded warriors may not be missing limbs or have battle scars--they are suffering with the greatest pain know pain known to man--higher than cancer or childbirth. Their suffering doesn't end with the pain, since the Department of Veteran's Affairs doesn't recognize RSD/CRPS as a disability even though it IS by the Social Security Administration. This means once they are discharged, they will receive no benefits for this catastrophic disease resulting in their inability to provide for their families resulting in the loss of their homes, their family, and even their own lives. It is through real-life documentaries like Nicole's that will help open other's eyes so they can see that the pain is indeed real and--Not in their heads." "This book is a wonderfully descriptive glimpse into the difficult and inspirational life of a chronic pain survivor. I am currently getting my Masters degree in counseling and will use this book for reference with my future clients. This is truly an inspirational story and I am thankful to have read it." "I loved this book. I am a health care professional and I would love this to be mandatory reading for every health care professional around the world. I was saddened to hear the struggle she had to be heard by some of her health care providers. What a strong girl and wonderful family that fought so hard to find a solution. Thank you for never giving up and thank you to your parents for being so supportive. Excellent book!!!" 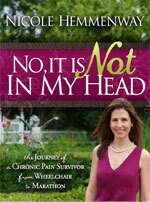 "I could not wait to read the book entitled, "No, It Is NOT In My Head!" I am a person with pain. It started when I was a teenager, and now some decades later and some two-dozen pain diseases later, I know there needs to be more books such as this one. In fact, every doctor, needs to read this book to really understand what it is like to deal with excruciating pain. We hear from Nicole exactly how difficult it is to get up each day knowing we will face pain and all its ramifications! Nicole points out in her book how difficult it is to live with pain, find doctors, and find the correct medication dosages. The book is not all gloom and doom, as Nicole gives us inspiration and not just for those that live with CRPS, but everyone who lives with pain. I urge you to read this book. Check it out, I did, read it, enjoyed it, related to the book, will definitely read it again and again. DO you know someone in PAIN? Give them this book. I recommend this book to those who are caregivers, friends of persons with pain, as well as DOCTORS! I know you will enjoy it." "Through Nicole’s journey, you feel her pain, understand and cry with her in her frustration, and in the end you triumph with her too. If you have any chronic pain in your life (or know someone who does), this book will help you realize there is a light at the end of the tunnel, and you can triumph too." "Anyone facing chronic pain will feel hopeful after reading 'No, It Is NOT In My Head: The Journey of a Chronic Pain Survivor from Wheelchair to Marathon.' To understand how this is a story of triumph and courage, look at Nicole today and notice the miraculous transformation of this courageous woman. Nicole Hemmenway demonstrates hope, guts and faith for any chronic pain sufferer or caregiver." Author, "Preemie to Woman in Sixty Short Years"
"This book is a must-read for anyone suffering from chronic pain or anyone who knows someone battling it. It's a story of hope told by a survivor and a real inspiration to those familiar with the debilitating effects of pain. Recognizing that each journey is different, Ms. Hemmenway shares her triumphs and trials while recalling the frustration and helplessness she experienced in her search for a cure. Both heartwrenching and inspiring in her retelling, Ms. Hemmenway offers the reader an inside peek into this much misunderstood and often incorrectly diagnosed and treated ailment. NO ITS NOT IN MY HEAD is not a cure for pain, but more a cure for hopelessness. Ms. Hemmenway offers inspiration and motivation to all those may feel no one understands. Going from wheelchair to marathon, she is proof that hope is part of the cure. Beautifully written, incredibly inspirational and highly recommended!"